An MLA who raised questions with Arlene Foster about a scheme now forecast to lose £30 million of taxpayers’ money has said that the losses are “staggering”. As reported in yesterday’s News Letter, the Audit Office found that Invest NI had incentivised those contracted to invest the money to spend it within a set time frame, rather than putting the focus on quality investments. The scheme was intended to support promising small and medium-sized companies which were unable to access bank loans in the wake of the credit crunch, but it has been beset with a series of problems. It is not clear how many of the firms to which loans were made have ceased trading, but the Audit Office estimated that taxpayers will lose £28.8 million, while private investors in the same project will likely walk away with a £44 million profit. There was not a bonus for handing out money – and there was a bonus for a good return on investments. However, auditors found that the bonuses were difficult to achieve and were less lucrative than the fees. And the ‘key performance indicators’ – which if not met could lead to lost fees – were focused on investment activity, rather than around the quality of that investment. In one case, Invest NI gave a contract to a company, E-Synergy, despite it being the most expensive firm to bid for the contract, only for it to become unhappy with the company’s actions and attempt to terminate the contract, leading to a costly legal battle and taxpayers having to pay the company to walk away earlier this year. North Antrim MLA Jim Allister was one of several people to raise questions about E-Synergy as far back as 2012. He asked Mrs Foster, who was the minister responsible for Invest NI, three Assembly questions about the firm and its performance. Yesterday Mr Allister said he was “disappointed” that “matters just carried on as before” with “quite staggering” losses now projected. A year before Mrs Foster authorised increased investment in the E-Synergy funds, Mr Allister asked her about the value for money of the arrangement. He said that the answers made clear that as well as receiving public money for running the scheme, the firm was charging separate monitoring and deal fees, with none of the fees performance-related, something he said was “win-win for the company” and “lose-lose for the taxpayer”. At the time of going to press, Mrs Foster had not responded. Five years ago Arlene Foster used the scheme which is now forecast to lose almost £30 million to chide bankers. 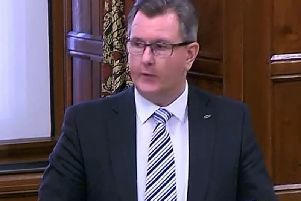 Speaking in the Assembly, Mrs Foster responded to a question from DUP colleague Simon Hamilton who asked her to agree with him that the Access to Finance scheme’s “success” showed that “no matter what the banks tell us” that there was an access to finance gap. Critiquing banks’ decisions not to invest ino some of the individuals to whom Invest NI’s managers gave money, she said that there was also “a growing credibility gap for the banks when they tell us that they are ready and willing to lend, yet ... businesses and individuals tell us weekly that they cannot get finance ... that is why we felt that we had to intervene through the access to finance pieces of work”.